Nowadays most of us use at least three social media sites (Twitter, Facebook and Google Plus). While it is really hard to choose between Facebook and Twitter (they are too different, so we use both), it’s almost impossible to get away from Google Plus is you use other Google’s projects like Gmail (so we are forced to sue that one as well). Go to the search box / / SHIFT+ALT+? ALT+? Lots of cool tips to save time when working with social media. I knew some of these, but some are a delightful surprise. Thanks for sharing! Wow thanks for sharing these shortcuts.Your post is very helpful to everyone as people are spending time on social media,this post can definitely save time. 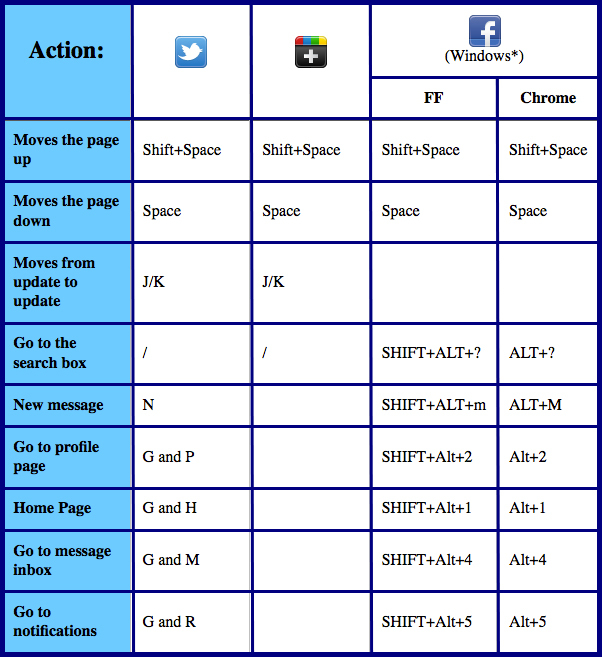 Nice list, keyboard shortcuts an under used part of social media, although most use for Facebook + Google+ as Twitter relatviely simple anyhow. These are definitely some great tips to help you save time when working on your social media campaign. Being frugal with your time is important when running a business so we should all make sure out time is spent wisely. That’s why I have my Social Media campaign run by professionals so that I can spend my time working while I know that my marketing is being done by experts.